These are Shortbread Raspberry Cookies. They are not traditional Chinese New Year cookies, but this buttery treat is a real crowd-pleaser. Preheat the oven to 180˚C /350˚F. Line baking sheet with parchment paper. Put the butter and sugar in a good-sized bowl and work them together by hand or with a wooden spoon until combined. Add the flour and baking powder and work them in. Add the egg and vanilla and knead them in until it is all compact and smooth. Cover with plastic wrap and let it rest for at least an hour. Working with a teaspoonful of dough (about 15 grams) at a time, roll the dough between your palms to form small balls and place the balls 2 inches apart on the baking sheets. Use the back of a 1/2 teaspoon measuring spoon to press into the center of each cookie. 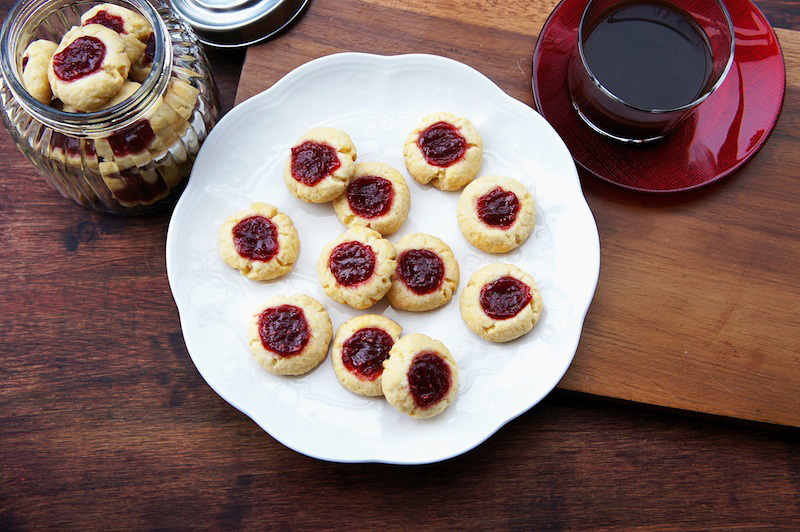 Fill the indentations of all the cookies with enough of the jam to come level to the tops. Bake for 17 to18 minutes, rotating the sheets from top to bottom and front to back at the midway point. The cookies should be only slightly colored-they might even look undone, which is fine: they should not be over baked. When the cookies are baked, remove the baking sheets from the oven and let the cookies rest on the sheets for 2 minutes before transferring them to cooling racks. Eek! I think I need to stop reading blogs until after the Super Bowl. These cookies are of a type my mother made over the years. I loved them. Angie, these delectable cookies are great for CNY celebration too ! 'Gong Xi Fa Cai' to you and family :) Have a blessed ' Water Snake ' year...I am looking forward to more bakes from you this year :) Have a nice day too !